Making you name plate is very interesting activity and it is also very easy to make, you can make this name plate without the support of the elders, as it does not require and cutting and pasting. You need paper and a marker only to make your name plate. 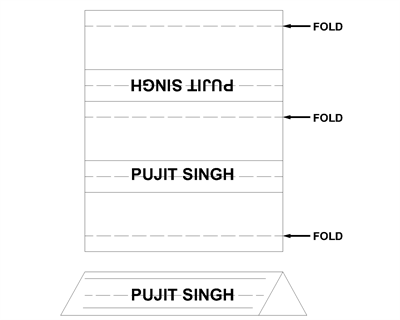 Take a paper of any color as you like and draw a line as shown in the picture given below, write your name and fold it as it shown in the picture. Your name plate is ready to use. See how it is easy to make your own name plate so go for it and enjoy. Very nice idea. Thanks for your idea. Will try it and hope it works too. Keep it up.